M.E.B.A. Engineers work with Deck Officers and Cabin Crew to save woman’s life. WSDOT's Jumbo Mark II class ferry the M/V Wenatchee. Photo Credit to WSDOT, photo by Jim Culp. This is the type of professionalism and unity you get from union crews who have received top-notch education and training. Last Saturday, after a 9:00 p.m. departure from Seattle, WA, the Washington State Ferry’s (WSF) M/V WENATCHEE was steaming across Puget Sound to Bainbridge Island. The WSF’s Bainbridge “A” watch was on duty. At around 9:15 p.m., two passengers notified the Captain that they saw a woman go overboard. Immediately, the Captain broadcast a “Man Overboard” alert and the crew began successful rescue efforts. The Captain ordered the ship’s M.E.B.A. engineers to reverse the vessel. The engine room quickly reversed both propellers while the pilot on watch hit the Man Overboard button on the radar to insert a marker in the computer to help with the search. The engine crew continued their work as the engines spooled up and the propellers dug in churning water in reverse. The M/V WENATCHEE’s deck crew with assistance from M.E.B.A. engineer, Greg Poor, prepared the rescue boat for immediate launch. The deck and cabin crew prepared the first aid response, handled crowd control of the vessel’s several hundred passengers, and located the missing woman’s husband. Out of the passengers, two Bainbridge Island doctors identified themselves to the mate along with a nurse, an EMT, a police officer and the Bainbridge Fire Chief. They all offered to help administer first aid and contacted emergency personnel on shore to prepare to transport the women to a hospital. During the incident, the deck crew instructed M.E.B.A. engineer, Greg Poor, to take control of the rescue boat operations. 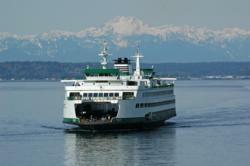 The ferries M/V TACOMA and M/V YAKIMA heard the M/V WENATCHEE’s radio distress calls on the company channel. Both ships immediately diverted from their scheduled runs to assist in the search. At WSF Headquarters the Operations Watch Supervisor began making notifications and coordinating the shore-side response. At around 9:25 p.m. the ship slowed to a stop as crew and passengers searched the water for the victim. A young child spotted the woman floating in the water. The crew launched a rescue boat to retrieve her while those on board the M/V WENATCHEE helped to navigate them. At 9:34 p.m. the cabin crew and M.E.B.A. engineer Martin Wakefield helped to lift the rescue boat back on the ship. The crew carried the victim to the set-up triage area where she received immediate medical attention from the crew and available medical personal on the vessel. The M/V WENATCHEE quickly sailed into Bainbridge, docking at 9:46 pm. A Bainbridge Island Fire Department Medic Unit was waiting to transport the victim to a Life-Flight helicopter to Harborview Medical Center. It is currently unknown if the woman jumped or fell off the ship. The M.E.B.A., America’s oldest maritime labor union, supplies U.S. Coast Guard licensed deck and engineering officers in both the U.S. domestic and international trades. The Union was established in 1875. Its members serve aboard tugs and barges, research vessels and in various capacities in the shoreside industries. In wartime, M.E.B.A. members have sailed in virtually unarmed merchant ships delivering critical defense cargo despite attacks from enemy aircrafts, submarines and warships. In times of peace, our members still face dangers such as piracy on the high seas in order to best serve their country.